U.S. Secretary of the Interior Sally Jewell recently met with the Steering Committee of the U.S. Virgin Islands (USVI) Climate Change Council to underscore the Obama Administration’s support to help communities prepare, plan and build capacity as they assess vulnerabilities and risks to climate change. During the meeting, Jewell also commended USVI Gov. Kenneth Mapp for his leadership in establishing the Council and for his commitment to strengthening the Islands’ climate resilience. 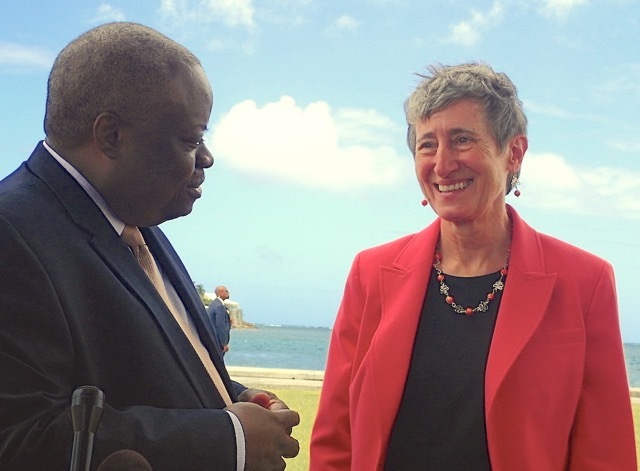 On Monday, Secretary Jewell announced that Interior awarded the USVI an $828,050 grant to support and spur its efforts to develop a robust, multi-sector climate adaptation strategy and coordinated framework to carry out its goals and objectives. The grant will fund five full-time project positions for two years and cover direct operating costs for one year. In an October 2015 Executive Order, Gov. Mapp directed all territorial government agencies to assess climate change vulnerabilities and risks to their operations and develop agency specific plans and decision-support systems for climate change adaptation. The Order established the Council to coordinate that effort, focusing on critical sectors of the local economy, including human health, agriculture, infrastructure, tourism and natural resources, and work with federal and local agencies, academic and research institutions, and the private and nonprofit sectors to develop an integrated climate change adaptation strategy. Situated in the Eastern Caribbean, the USVI consists of the main islands of St. Croix, St. John and St. Thomas, as well as a number of smaller islands. In total, the islands cover about 136 square miles of land, with 604 square miles of sea and 117 miles of coastline. Because of their geographic and economic scale, exposure to extreme weather events and reliance on tourism and imported goods, the islands are highly vulnerable to the effects of climate change. The USVI’s coastal zone is particularly at risk because of the concentration of hotels, businesses, critical infrastructure and residential development. This increases their exposure to storm surge and sea level rise. President Obama’s June 2013 Climate Action Plan to reduce carbon pollution, create more clean energy sources, and minimize the impacts of climate change directed Interior to build resilience into its programs, on the lands it manages and with the communities it serves around the nation. Combatting climate change is a strategic priority for the department’s Office of Insular Affairs (OIA) because of the pronounced adverse impacts of climate change on the insular areas and requests by island leaders for U.S. assistance. In response to Presidential Executive Orders and Interior Secretarial Orders, the department has taken actions to curb carbon emissions and adopt a more proactive posture in mainstreaming climate change across federal programs to support resilient federal investments. OIA has worked with territorial governments to advance climate change initiatives through educational awareness, funding and policy considerations, including a major stakeholder forum on Guam in June 2015. OIA has encouraged the U.S. territories to establish task forces and councils to coordinate their efforts and Assistant Secretary Kia’aina has announced that climate change adaptation planning, assessment and/or implementation are the highest priority for OIA’s technical assistance funding in fiscal year 2016. OIA also provided the Caribbean Landscape Conservation Cooperative $30,000 in December 2015 to provide workshop training and technical assistance to the USVI on climate change adaptation planning. President Obama’s fiscal year 2017 budget request for OIA includes a $4M increase to support community, landscape, infrastructure adaptation and resilience initiatives which address climate change impacts. One of the highest priorities would be to help the governments develop, strengthen, and/or implement climate adaptation plans.